Jennifer was a Poster Presenter at the National Council of Social Studies Annual Conference on November 13, 2009, at the Georgia World Congress Center in Atlanta. The theme of the conference was: Dreams & Deeds: The Civic Mission of Schools. Jennifer submitted a proposal entitled, �Jeannette Rankin: First U.S. Congresswoman and Georgia�s Adopted Daughter�. Jennifer Dawson is a sixth grade Advance Content Social Studies teacher at Lost Mountain Middle School in Kennesaw, Cobb County, Georgia. She is a self-starter and very interested in history, geography and economics. Jennifer was a Poster Presenter at the National Council of Social Studies Annual Conference on November 13, 2009, at the Georgia World Congress Center in Atlanta. The theme of the conference was:Dreams & Deeds: The Civic Mission of Schools.Jennifer submitted a proposal entitled, “Jeannette Rankin: First U.S. Congresswoman and Georgia’s Adopted Daughter”. The Rankin Proposal was approved and Jennifer gathered extensive material, including photos, of Miss Rankin. 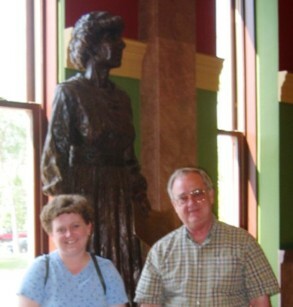 Jennifer asked her parents, Wendell & Betty Dawson, to be present and talk with visitors and help with the exhibit. We had personally known Miss Rankin and Jennifer was placing emphasis on her Georgia connections. When Jennifer was in the eighth grade in the mid-eighties, she was assigned a project in history to write a research article about a famous person in history.Her teacher was Coach Johnny Arnold.She considered writing about Geraldine Ferraro, 1984 Democrat nominee for Vice-President. We discussed her project and I suggested she consider writing about the first U S Congresswoman, Jeannette Rankin, who had lived in our community until moving to Carmel, California in 1973 where she died. Not only did Jennifer’s father and mother know Miss Jeannette Rankin but other neighbors were great friends of Jeannette. 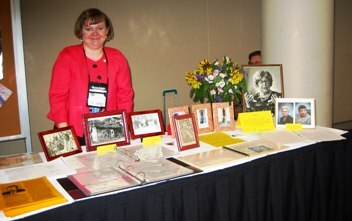 One such person was our Aunt Becky and Connie who had many pictures and memorabilia about Jeannette Rankin. 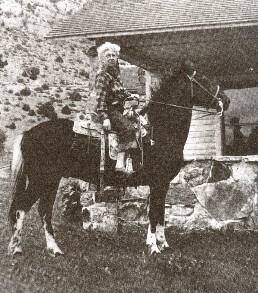 Miss Rankin had given Becky several pictures before she left Georgia.Rev Ted Harris had written his doctoral thesis on Miss Rankin. Aunt Becky had a copy.After looking at the material, Jennifer decided to write about Jeannette Rankin.That started her on a journey to being a living expert on the history of Jeanette Rankin, especially in Georgia. Jennifer put a lot of effort into the project and got an A for her paper. That paper and grade was on display at the World Congress Center with a note from Coach Arnold that drew many comments from visitors to the exhibit.As it turned out, the paper was sent to the Georgia Department of History in 1993 as supporting material for the application for the Georgia Historic Marker located on Mars Hill Road across from the Oconee County Middle School. 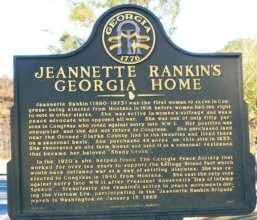 Jennifer’s interest in the historic presence of Miss Rankin grew and she did more research and reading. 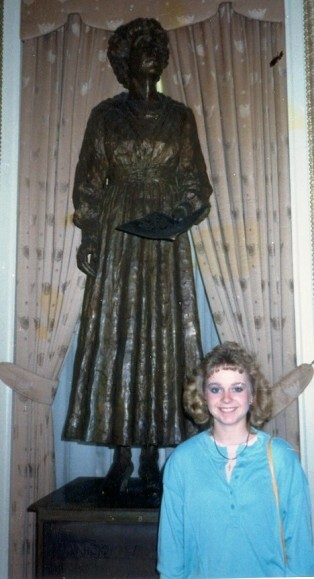 Jennifer had her picture taken at the Jeannette Rankin Statue in Statutory Hall of the U S Capitol (1985, 1991& 2007). (Jennifer has also been photographed at the Rankin Ranch at Avalanche Gulch in Montana and with the Rankin Statue in the Montana State Capitol in Helena, MT.